Clear Plastic Report Binding Covers 8.5" x 11" Your Choices Here - by thickness 5 mil Crystal Clear Gloss PVC 5 mil Crystal Clear Gloss PVC with tissue 5 mil Clear Printable polyester 6 mil Matte Clear PVC 7 mil Crystal Clear Gloss PVC 7 mil Crystal Clear Gloss PVC with tissue 7 mil Matte Clear PVC 10 mil Crystal Clear Gloss PVC 10 mil Crystal Clear Gloss PVC with tissue 10 mil Clear Gloss OPP recycable 10 mil Matte Clear 12 mil Matte Clear Sand Texture recyclable 12 mil Striped Clear recyclable 16 mil Clear Gloss OPP recycable 16 mil Matte Clear OPP 16 mil Crystal pattern Clear recyclable 16 mil Clear Hologram recyclable 20 mil Clear Gloss OPP recycable 20 mil Clear Matte OPP Special Request ? Textured Report Binding Covers 8.5" x 11" Your Choices Here - by thickness 12 mil Matte Clear Sand Texture recyclable 12 mil Black Sand Texture recyclable 12 mil Navy Blue Sand Texture recyclable 12 mil Maroon Sand Texture recyclable 12 mil Dark Green Sand Texture recyclable 12 mil Striped Clear recyclable 12 mil Striped Blue Transparent recyclable 12 mil Striped Green Transparent recyclable 12 mil Striped Maroon Transparent recyclable 12 mil Striped Smokey Transparent recyclable 15 mil Black Flexigrain Pebble finish 16 mil Crystal pattern Clear recyclable 16 mil Crystal pattern Blue recyclable 16 mil Crystal pattern Red recyclable 16 mil Black Leather Texture recyclable 16 mil Blue Leather Texture recyclable 16 mil Dark Green Leather recyclable 16 mil Dark Grey Leather Texture recyclable 16 mil Maroon Leather Texture recyclable 16 mil Navy Blue Leather Texture recyclable 16 mil Purple Leather Texture recyclable 16 mil Red Leather Texture recyclable 16 mil Yellow Leather Texture recyclable 16 mil Clear Hologram recyclable 16 mil Blue Hologram recyclable 16 mil Smokey Hologram recyclable 20 mil Black Leather Texture recyclable 20 mil Navy Blue Leather Texture recyclable Special Request ? Clear Plastic Legal Binding Covers 8.5" x 14" Your Choices Here - by thickness 5 mil Crystal Clear Gloss PVC 5 mil Crystal Clear Gloss PVC with tissue 5 mil Clear Printable polyester 7 mil Crystal Clear Gloss PVC 7 mil Crystal Clear Gloss PVC with tissue 10 mil Crystal Clear Gloss PVC 10 mil Crystal Clear Gloss PVC with tissue 12 mil Sand Texture Matte Clear recyclable 12 mil Striped Clear recyclable Special Request ? Textured Legal Binding Covers 8.5" x 14" Your Choices Here - by thickness 12 mil Sand Texture Matte Clear recyclable 12 mil Striped Clear recyclable 16 mil Black Leather Texture recyclable Special Request ? Clear Plastic Report Binding Covers 8.75" x 11.25" Your Choices Here - by thickness 5 mil Crystal Clear Gloss PVC 5 mil Crystal Clear Gloss PVC with tissue 5 mil Clear Printable polyester 7 mil Crystal Clear Gloss PVC 7 mil Crystal Clear Gloss PVC with tissue 10 mil Crystal Clear Gloss PVC 10 mil Crystal Clear Gloss PVC with tissue 10 mil Clear Gloss OPP 100% recycable 12 Mil Sand Texture Matte Clear recyclable 12 mil Striped Clear recyclable 16 mil Clear Crystal pattern recyclable 16 mil Clear Hologram recyclable Special Request ? Textured Report Binding Covers 8.75" x 11.25" Your Choices Here - by thickness 12 mil Sand Texture Matte Clear recyclable 12 mil Black Sand Texture recyclable 12 mil Navy Blue Sand Texture recyclable 12 mil Maroon Sand Texture recyclable 12 mil Dark Green Sand Texture recyclable 12 mil Striped Clear recyclable 12 mil Striped Blue Transparent recyclable 12 mil Striped Green Transparent recyclable 12 mil Striped Maroon Transparent recyclable 12 mil Striped Smokey Transparent recyclable 16 mil Clear Crystal pattern recyclable 16 mil Blue Crystal pattern recyclable 16 mil Red Crystal pattern recyclable 16 mil Black Leather Texture recyclable 16 mil Blue Leather Texture recyclable 16 mil Dark Green Leather Texture recyclable 16 mil Dark Grey Leather Texture recyclable 16 mil Maroon Leather Texture recyclable 16 mil Navy Blue Leather Texture recyclable 16 mil Purple Leather Texture recyclable 16 mil Red Leather Texture recyclable 16 mil Yellow Leather Texture recyclable 16 mil Clear Hologram recyclable 16 mil Blue Hologram recyclable 16 mil Smokey Hologram recyclable Special Request ? Textured Binding Covers 8.75" x 14.25" Your Choices Here - by thickness 12 mil Sand Texture Matte Clear recyclable 12 mil Striped Clear recyclable 16 mil Black Leather Texture recyclable Special Request ? 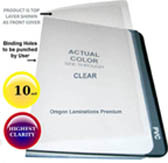 Clear Plastic Report Binding Covers 9" x 11" Your Choices Here - by thickness 10 mil Crystal Clear Gloss PVC 12 mil Sand Texture Matte Clear recyclable Special Request ? Textured Report Binding Covers 9" x 11" Your Choices Here - by thickness 12 mil Sand Texture Matte Clear recyclable 15 mil Black Flexigrain Pebble finish 16 mil Black Leather Texture recyclable Special Request ? Clear Plastic Report Binding Covers 11" x 17" Your Choices Here - by thickness 5 mil Crystal Clear Gloss PVC 5 mil Crystal Clear Gloss PVC with tissue 5 mil Clear Printable polyester 7 mil Crystal Clear Gloss PVC 7 mil Crystal Clear Gloss PVC with tissue 10 mil Crystal Clear Gloss PVC 10 mil Crystal Clear Gloss PVC with tissue 12 mil Sand Texture Matte Clear recyclable 16 mil Clear Gloss OPP recycable 20 mil Clear Gloss OPP recycable 20 mil Matte Clear OPP Special Request ? Textured Report Binding Covers 11" x 17" Your Choices Here - by thickness 12 mil Sand Texture Matte Clear recyclable 15 mil Black Flexigrain Pebble finish 16 mil Black Leather Texture recyclable Special Request ? Clear Plastic Report Binding Covers 19" x 25.5" Your Choices Here - by thickness 5 mil Clear Printable polyester Special Request ? Textured Master Sheet Binding Covers 35" x 27" Your Choices Here - by thickness 12 mil Striped Clear recyclable 12 mil Sand Texture Matte Clear recyclable 12 mil Black Sand Texture recyclable 16 mil Black Leather Texture recyclable Special Request ?